When I get a commission, I try to arrange to have my own photo shoot with the subject rather than accept my client’s own photos as references. I have only had one commission thus far that was not exactly within reasonable traveling distance. As a matter of fact, the commission was from Texas, which is approximately 1400 miles from Shiloh, NC – just slightly beyond reasonable travel distance. I opted for the client to provide their own ref photos with guidance from me on how to take them. However, the photos were still remarkably bad even though they obviously did try to take good shots. I think that was the worst portrait I ever made, and it shows just how important it is to be able to take your own reference shots. I’m going to cover this topic in two or three articles so that each one doesn’t get too long or boring. I hope I give you the information you need, but if not, please contact me and ask me whatever you want and I will try my best to answer your questions. 1. Make sure they have the copyright for you to use the photo they give you. Some people will try to give you a photo that was taken by a professional photographer. The photographer retains the copyright to all of their photos unless they sell the copyright to someone else. If that is the only type of photo your client has, find out who the photographer is and try to get their permission to use the photo. Otherwise, in order to protect yourself from a lawsuit, you'll have to cancel your commission. 2. Try to guide your clients in how to take the photos. Use the same guidelines I will give you in part II of this article. 3. Remember, you ARE an artist. You can change the background and add or subtract highlights and shadows. You do not have to follow the photo exactly! The first thing you have to do, obviously, is set up a time and date with the client for the photo shoot. I always do my shoots at the client’s house, for various reasons. The subject will be most comfortable at home. If your subject is nervous or tense, it will show up like a red flag in the photos. Number one rule is that you want your subjects to be at ease when you take their photo. It is far easier to get outdoor AND indoor shots at the client’s home as they have ready access to both. If you go somewhere public to take the photos, you would be extremely limited in the kind of shots you would be able to take, and that you don’t want. You will need to find a day and time that agrees not only with both you and your client, but also with the subject. This can be an exercise in patience and pain. If the subject is an animal that regularly gets groomed and/or their fur cut, be sure your client has them groomed and cut no more than 2 weeks before the photo shoot, otherwise, the fur will have had time to grow back and look messy again. Also, I always ask for one to two hours time. I also go over the contract at this time, so I leave plenty of time to get the photos I need plus time to go over the contract thoroughly. I did a photo shoot with a Bichon-Friese one time. I had a terrible time getting the shoot scheduled because my client was an investment banker who traveled almost constantly. She sent Bentley to get groomed, we set the date, then she was sent away on business at the last minute and had to cancel. By the time we finally were able to do the photo shoot, Bentley’s fur had all grown back. 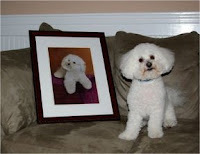 I didn’t realize the difference though, because I had never seen Bentley (or a Bichon-Friese) that was freshly groomed. However, when I delivered the portrait on Bentley’s birthday, there was a newly groomed Bentley and I barely recognized him. When I put the portrait on the sofa, he jumped right up and sat down next to it. I took a photo of him with the portrait, and I was horribly embarrassed!! He looked nothing like the portrait with the exception if a few features on his face and some character traits. My client understood and said the portrait looked just like Bentley when his fur was longer, but I was mortified and promised myself this would never happen again! Batteries - Always have extra batteries charged and in your camera bag. Make sure you have a way to separate your used batteries from your charged ones, other wise you’ll have a heck of a time trying to find four batteries that are all charged when you need them. Camera - If your camera is digital, have at least one memory card in your bag. Your memory card should have at least 4 Gigs of memory, which today is not very expensive, depending on which type you need to get. I use SD cards and the last one I bought (Christmas 2007) cost $40.00. I always have two cards because when I go to upload one card I put the other one in my camera right away. The card I am uploading stays in my computer until the next time I need to upload, and then I just trade them out again. This method has allowed me to always have one memory card in my camera at all times. It’s just a little trick I play with myself so I don’t forget my card at home. After my previous digital camera got stolen (along with my camera bag, batteries, and memory cards) You don’t know how many times I went off with my camera and no memory card! It was very frustrating! I was so used to having two cards and using the “swap out” method that when I only had one card I was forgetting my card at home in my computer. Tripod - Bring a tripod, although I have never used one yet, you never known when it may be necessary. Make sure you know how to use your tripod very well! You do not want to waste time setting it up, getting the camera on, setting different angles, etc. I never use one because I prefer to get candid shots and those are very spontaneous. Impossible to get with a tripod. Toys & Treats - If the shoot is with an animal, be sure to have some treats and a squeaker toy with you. It is amazing the difference between a bored dog, cat, or horse and one with their full attention riveted in one direction and ears pointed! However, you might want to save the treats for after the shoot. I made the mistake of trying to get a dog’s attention with a treat one time, and I never could get him under control again for the entire rest of the photo shoot! Treats are either for well trained dogs or for a reward AFTER the shoot. Of course, always ask the owner first to make sure it is all right. Camera Bag - Hopefully you bought a camera bag when you bought your camera. You can carry all of your extra batteries, memory cards, lenses, animal toys & treats and other camera equipment in the camera bag. It’s a handy little piece of equipment to have, but you’ll want to use the shoulder strap that came with it so you can keep your hands free for other things. Laptop - One of the reasons my husband bought a laptop for me was so I could immediately plug in my memory card, upload the photos of the shoot, and go through them with my client right then and there. 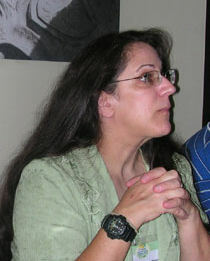 I can pull the particular photos I want to use, discuss the pros & cons of it, what changes I might want to make, etc. By the time I leave the shoot I am prepared to start on my first sketch of the portrait. I just have to make the laptop is completely charged the night before. Date Book - I always bring my date book so I can give my client some sort of timeline of when they can expect me to reach the halfway point (which is when a second payment is usually due) and when the portrait should be finished by. We also decide the delivery date, although I don’t like to set that date in stone unless my client needs the portrait for a special occasion such as a birthday or Christmas. Commission Contract - DO NOT FORGET TO BRING THE CONTRACT!!!!!!! Unless you have already gone over the contract and had your client sign it, they must sign it at this point and give you a deposit and down payment. You will need to give your client a copy of the contract as well. Two ways you can do this. One is to take the signed contract and make a copy of it then either hand deliver it or mail it to your client. The second way is to bring two copies of the contract with you and have your client sign both (you sign as well), then leave one copy with them while you file the other one in your filing cabinet for safekeeping. Directions - Do not forget your directions and your client’s phone number in case you need to call them!!!!! Trust me, you WILL need them. Do not try to go by your memory! Map - I always bring a street map of the area with me as well. If I get lost I can pretty much figure out how to get there by using the map, but if not, I always have my client’s phone number with me too! (UPDATE: Today many people like to use GPS. Please believe me when I say that GPS will NOT always get you to where you are going. One person got sent right into the Great Dismal Swamp when they used GPS to come to my house. Always have a local and updated street map if at all possible!). Change of Clothes - Remember we ARE talking about animals here! You never know just what to expect, so you might as well be prepared for anything (such as dirty paws, grass stains, mud, manure, and a multitude of other things! It is especially important to have a change of clothes if you have to go somewhere else after you finish with the shoot. Hair tie, barrette, etc. - Yes, I know I’ve already mentioned this before in a previous article, but it doesn’t hurt to mention it again. Be sure to take care of your hair if it is long enough to get in your eyes, especially if it is a windy day. I'll go over how I actually conduct my photo shoot with my subject. I'll also have some photos that I took at a couple of photo shoots and YOU decide which ones should be used. Put your vote for which one in a comment and I'll show you which ones I actually did use. Thank you Beth and Belinda!! I'm glad you liked the article. Thanks for publishing this informative article. I've been reading for a while but I've never posted a comment. I've bookmarked your website and shared this on Twitter.